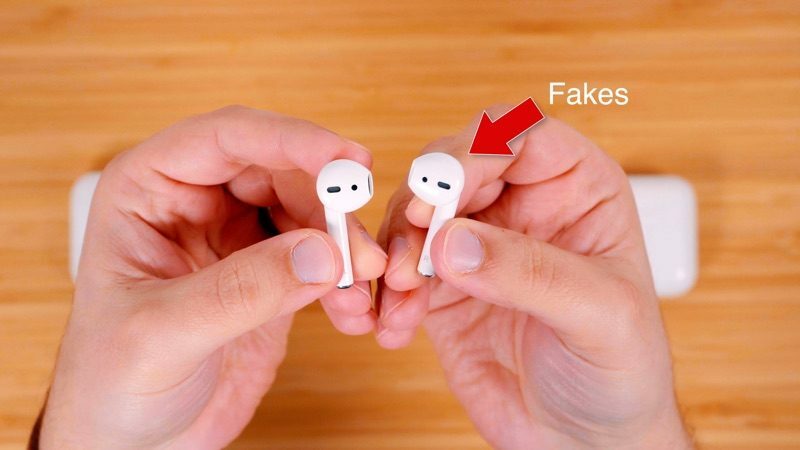 Apple's AirPods are one of its most popular product lines in recent years, and have resulted in crazy demand, memes, and dozens of knockoff products. In our latest YouTube video, we picked up a pair of $50 i10 TWS earphones that have been designed to look like AirPods to see how they measure up to the real thing. The i10 TWS AirPods knockoffs are almost carbon copies of the AirPods and at first glance, it's hard to tell them apart. 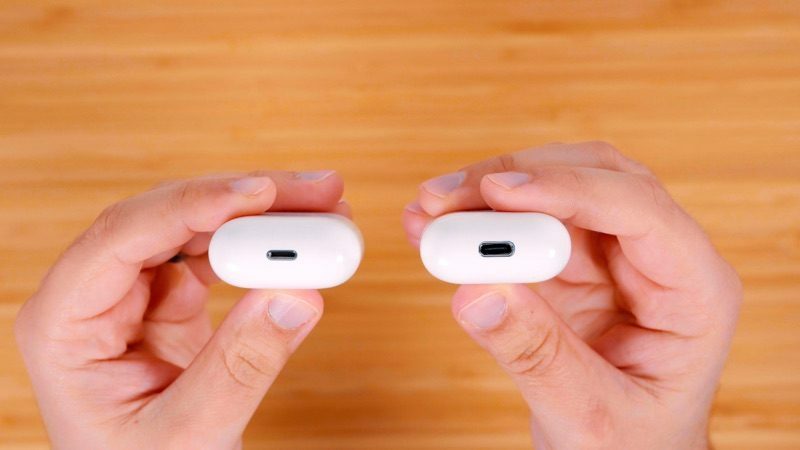 There are some noticeable differences to distinguish the two, though, which will be obvious to AirPods owners. Instead of a Lightning port, the i10 TWS earbuds have a USB-C port for charging, though they also support Qi-based wireless charging, which the AirPods don't offer. There's also an LED charging indicator light on the front and no Bluetooth pairing button on the back. 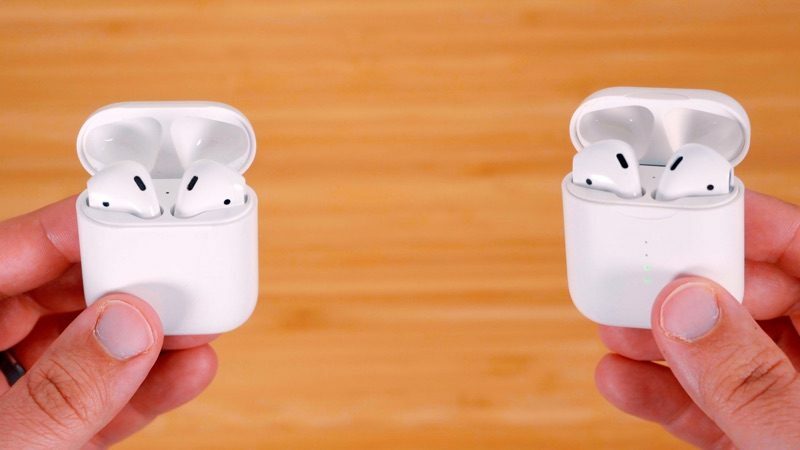 When it comes to the case, the i10 TWS is clearly lower quality than the AirPods as it's lighter, feels flimsier, and makes a clicking noise when you open the lid, but the fake AirPods inside look quite similar to real AirPods. The i10 TWS earbuds are nearly indistinguishable from AirPods, and they sound pretty similar too. Sound quality was about the same with both, and the same goes for voice quality when using the microphone for calls. Like the AirPods, the i10 TWS earbuds use gestures, with a single tap able to play/pause music and a double tap able to skip tracks. A two-second hold activates a voice assistant like Siri. There are missing AirPods features, though. There's no autopause/autoplay function when removing one of the i10 TWS earbuds from your ear, and there's no simple pairing due to the lack of a W1 chip. The i10 TWS earbuds pair to a device like any other Bluetooth headphones, and they also don't enjoy the same long range. As for battery life, they last for about three hours worth of streaming music and charge up in about an hour and a half over USB-C. So while these look, feel, and sound like AirPods, the i10 TWS earbuds are missing some key features, which explains why the price is so much lower. You can snap these up for about $50, which is more than $100 less than the AirPods. Would you ever buy knockoff AirPods instead of the real thing? Let us know in the comments. Better to lose something @ $50 than lose something @ $160. Same thought process I used when why I married the ugliest chick I could find. Why I’m leaving Apple and it’s overpriced ********. See trash can Mac Pro. Stop falling for it. Then please put your money where your mouth is and get outta here. Given how AirPod batteries degrade so much after 12 months, these might be worth looking into. No, I would not buy a cheap knockoff. You get what you pay for. I've made that mistake buying cheap computer cables or cheap laptop chargers, but have regretted it every time. and it’s overpriced ********. See trash can Mac Pro. Stop falling for it. So you're switching vendors because of a product that's six years old? Why, he’s as entitled to express his opinion as you and he didn’t make it personal like you just did. Really? I have my AirPods since launch in December 2016, and mine are still going strong, where at least I’m able to hold 50% or more battery life with my usage.